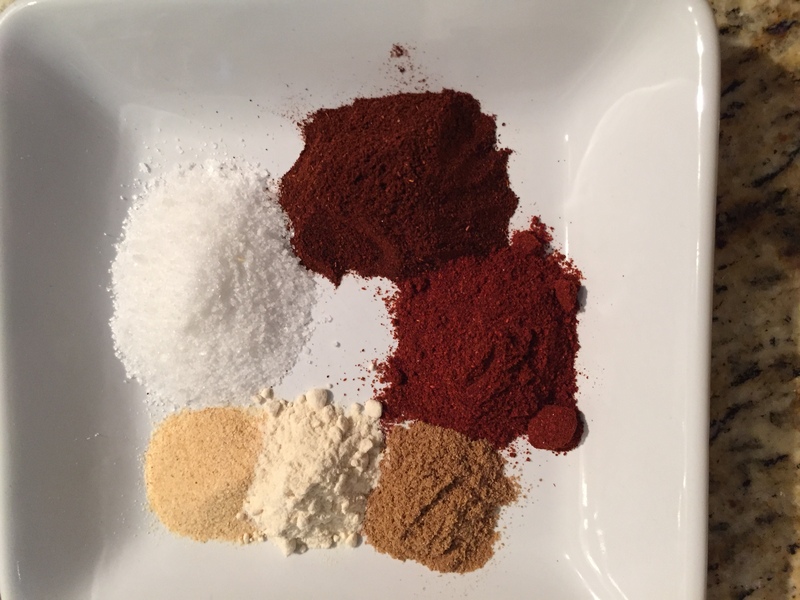 Seasoning is probably the most important thing you can do to enhance the flavors of whatever you are cooking. It’s important to season as you go.This helps to build layers and depth of flavor. 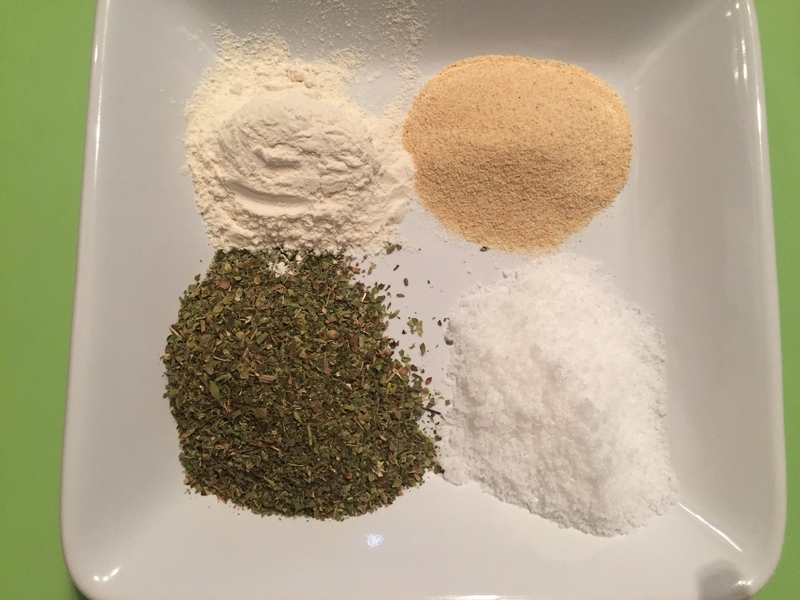 This seasoning mix was the very first one I made, and is probably my favorite. It can be used on any protein, vegetable, and sauce. I basically throw it in a mason jar, shake, and sprinkle. Like I said earlier, add all the ingredients into a mason jar, shake so all the ingredients are well incorporated. You’re done. A frittata is a wonderful dish. It is versatile, and easy to make. What’s so nice about making a frittata, you can put anything you want into it. It’s a good way to clean out the refrigerator, and not feel like you are eating leftovers. This is what I had in my refrigerator to make this frittata. Preheat oven 350 degrees. Make sure you use a pan that can be put into the oven. In a large bowl mix the eggs and water until well combined, and eggs look yellow throughout. Set aside. In a medium size skillet, melt bacon fat and then add the sweet potatoes, spinach, tomatoes, and sea salt. Cook until all ingredients are softened. When the veggies are how you like them, pour the eggs into the pan. When the eggs are about half cooked through put pan into the oven. The eggs are done when knife inserted into the eggs comes out clean. Take out the frittata out of the oven and top with cilantro. Enjoy. Often when we think of meatballs we usually think of Italian food. I wanted to go in a different direction with these, putting an Asian twist to the meatballs. These would make great appetizer bites. There is so much flavor with the ginger, coconut aminos, and all those other delicious ingredients. I’m glad I made these meatballs with the Asian twist. Preheat the oven to 375 degrees. Line a rimmed baking sheet with foil. In a large mixing bowl combine all ingredients. Form the meat into 36 meatballs. Bake for 20-30 minutes until cooked through. Don’t overcook, you’ll end up with golf balls. If you haven’t tried zoodles then you are missing out. The first time I made these I was a little disappointed with the texture. I thought they were “mushy”, not what I wanted. so I went back to the kitchen and made an adjustment. It was something so easy, I just smacked my forehead and said, duh. Yeah, it was one of those moments. The key is some sea salt, towels, and time. 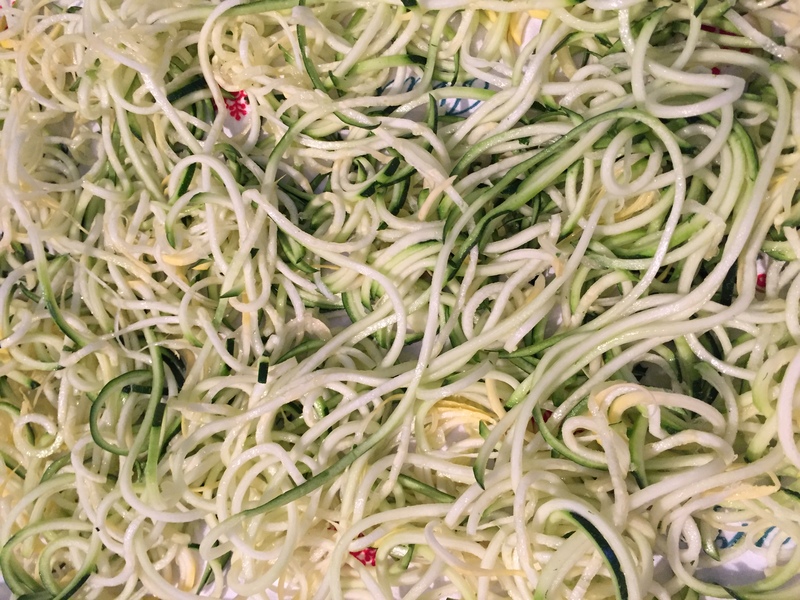 Something to remember – it may look like a lot of zoodles, it really isn’t, so make at least twice as much as you think you would need. You will need: 2 thin towels, sheet pan, a spiralizer or vegetable peeler, zucchini, and sea salt. Line the sheet pan with a one of the towels. Use your spiralizer according to manufacturer’s directions. Spread noodles evenly on towel. Sprinkle sea salt on the zoodles, let rest for about 30 minutes. This is important, it will draw out some of the moisture, which is what can make the zoodles “mushy”. Remember, we don’t want “mushy”, we want el dente. Now it’s time to transfer the zoodles to the other towel. Pile them into the middle and gather the ends of the towel, twist and squeeze out any remaining liquid. Now you can heat them in skillet until warm, top with your favorite sauce, and or protein.